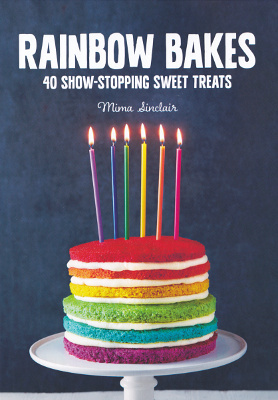 This is a baking book full of rainbows and unicorns. The presentation is nice, with clear photographs and extra unicorn pictures adorning the pages. Recipes are split into four sections: whole cakes, small bakes, biscuits and cookies, and sweets and desserts. Making things rainbowy means food colouring, which the book does discuss. The notes match my experiences. Liquid ones tend to flavour things when enough is used for dark colours, as well as often making mixtures too runny. The book doesn’t say it, but liquid red is a big culprit for taste, as it’s often beetroot. I used gel colourings, as these are easily available and go bright without making things taste odd. The recipes have clear lists of things needed. Quantities are written out in full, so it says tablespoon rather than abbreviating it. This makes recipes a lot more accessible. There’s a wide range of things available, from fudge to bagels. Though the first impressions were good, the next step was to make things and see how the instructions held up. My biggest project was the anti-gravity cake. This is a full-sized cake decorated to look as though rainbow sprinkles are pouring out of a floating jar above it, plus an optional unicorn. I chose this as a birthday cake. 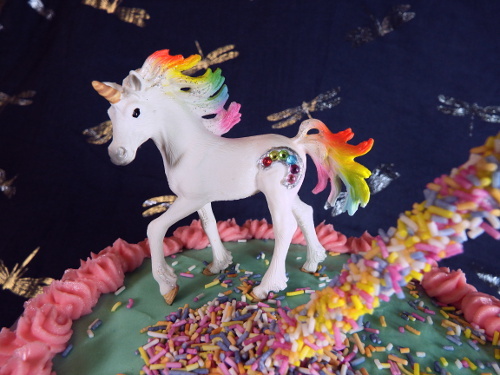 It isn’t noted in the recipe, but the unicorn used is from a toy range, rather than being sold as a cake topper. It makes it a good choice for children and adults like me, as it means the birthday person gets to keep the toy. I got the exact same unicorn as the book for my attempt at the cake. The only thing I switched out was the sprinkles: I used strands instead of confetti. The instructions were clear and easy to follow. However, it suggests cutting the cake layers to make more layers. This would be fiddly to do and I couldn’t see a point in it, so I didn’t do that. The cake is already three layers deep and tall. Other than that, everything worked out. I made the dribble icing a bit too runny, so I didn’t get quite such a good effect. My blue was also different and turned teal when added to yellow buttercream. None of that was the fault of the instructions, and the differences were things someone wouldn’t notice unless they compared it to the book picture. I’d note this one does take a long time to do, as it has a lot of little bits to sort out. The final effect is good though. Image Caption: A large colourful cake resting on a silver cake board. The cake is covered in teal buttercream. Purple and yellow icing dribbles down the edges. Pink buttercream is piped around the top edge. On the top, rainbow sprinkles fall down onto the cake from an apparently floating jar (spoiler: the falling sprinkles and jar are stuck to a stick). 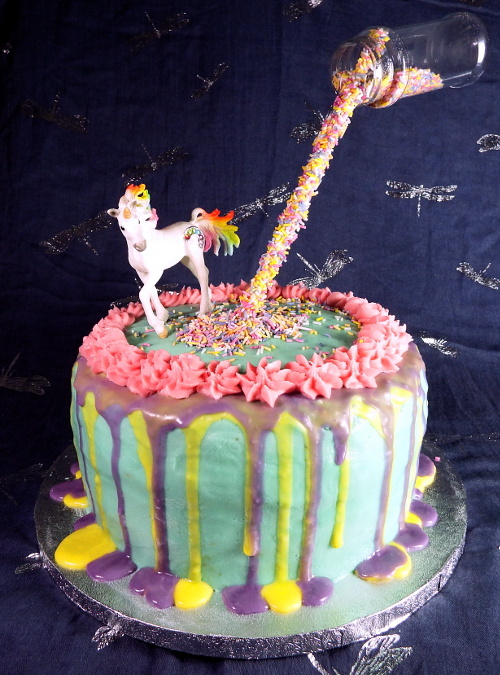 A white unicorn toy with rainbow mane stands near where the sprinkles fall on the cake. The background is a blue cloth with a silver dragonflies design. 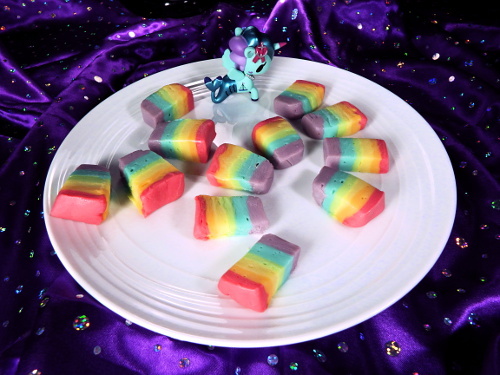 An easier project was the rainbow fudge. It’s a quick fudge recipe, so it doesn’t need boiling. An oddity here is it needs melted white chocolate, but doesn’t suggest the common method of floating a plastic bowl in a saucepan of water. Though a heavy-bottomed saucepan can work for this, the bowl method is much less likely to burn, so I used the bowl. I also swapped the orange extract for vanilla, as it suits family taste preferences better. This is a really quick recipe in some ways, but slow in others. It’s quick to melt everything down and make the basic fudge mixture. There’s not a lot to go wrong at this stage. What’s slower is the rainbow part, as the mixture needs to be separated and coloured. Then each layer needs a quick freeze before adding the next layer. It’s not difficult, but if cooking with children, this stage might be boring for them. Cutting the fudge the next day was a bit challenging. I tried various knives, but ended up with the bread saw (a large serrated knife). It helped to freeze it for a few minutes between cuts. At this point, the fudge was very sticky, and would be difficult to transport. We ate it over several days, storing it in the fridge on plates covered in cling film. On the second day, it was firmer and much less sticky. If I was making this to take somewhere, I think I’d factor in that extra day of hardening. The family really enjoyed the fudge. It mainly tastes of the white chocolate, so it’s worth getting good quality chocolate for it. This is one I can see making again. Image Caption: Rectangles of fudge on a white plate. Each piece of fudge has rainbow stripes of red, orange, yellow, green, blue and purple. They’re arranged in three semi-circles, as though they’re rainbows. A blue merunicorn toy also sits on the plate. The merunicorn has a boat symbol and is wearing an anchor hair ribbon, all modelled in plastic. 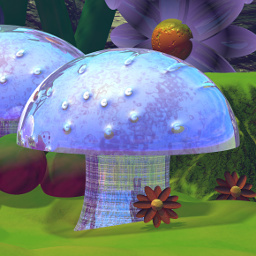 The plate rests on a silky purple cloth with shiny spots. My final choice was another of the sweet recipes, but one that’s more advanced. The fruit jellies are made in a similar way to jam, so it has more potential to go wrong if it isn’t boiled at the right temperature (it won’t set if it isn’t). This one also didn’t need artificial food colouring, so is a good choice for a sweet with nothing artificial. The main issue getting ready for this was the liquid pectin. For all the rest of the recipes, I got the ingredients from local supermarkets. This one had to be ordered, as I don’t have a baking shop locally. I hit an obvious issue when I got started with this. The recipe recommends using a sugar thermometer, to make sure the boiling temperature is high enough. It’s a good idea in theory, but the average sugar thermometer is designed for people making big pots of jam. The quantities for the jellies were too small to cover the end of the thermometer. Usually, I’d simply have not bothered with the thermometer, but I figured a new cook would likely try to follow the instructions anyway. It’s a really bad idea. The thermometer can’t read the right temperature, and it can’t be attached to a small saucepan, so it’s a dangerous juggle to attempt to stir and test the temperature at the same time. The first batch did end up burning slightly due to this, though not in a way that couldn’t be salvaged (it just burnt a bit to the bottom, it didn’t flavour the whole mix). I never managed to read the required temperature on the thermometer. For batch two and three, I went by my own experiences. That means I brought them to the boil, added the lemon juice and pectin as instructed, and then boiled rapidly for three to five minutes before testing. The recipe does explain how to test if it’s ready, by dropping some into cold water, which is all you really need. If it hasn’t hit the right temperature yet, it won’t pass the test. The final jellies worked out fine. I made strawberry, blackberry and pineapple. The family were divided on which they liked best. I thought strawberry tasted a bit too much like solid jam, but that might be a plus for someone else. Pineapple was my favourite. 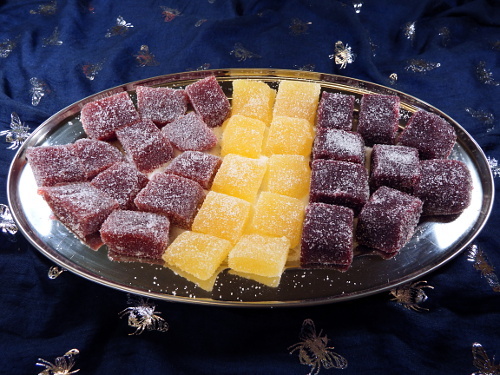 Image Caption: Fruit jelly sweets on a tray. The sweets are roughly square and covered in granulated sugar. From left to right, they’re strawberry (dark red), pineapple (yellow) and blackberry (reddish purple). The tray is oval and silver. It’s placed on a dark blue cloth covered with a silver bees design. This is a book where it feels like someone had tested the instructions, as generally they were clear and tried to give advice on the best way to approach things. The photographs also looked like the actual items. What I expect happened with the jellies is the tester didn’t need to use a thermometer, so hadn’t hit that issue. Something that isn’t mentioned is the unicorns in the photographs. Some look like cake toppers, but others are toys, such as the one for the cake I made. It might not be obvious to check toy shops, rather than baking shops, for these items. I used the same toy as the book for the anti-gravity cake, which is a Schleich Bayala rainbow unicorn foal. These are easily available in Europe (available at Amazon UK). It may be harder/more expensive to get this exact one elsewhere, but there are other designs from the Schleich Bayala range in the US (available at Amazon.com). These are nicely detailed toys and the range covers a whole bunch of fantasy animals and people. The toy in the fudge photograph is one the book doesn’t use, but also came from the toy shop. It’s a Tokidoki Mermicorno (available at Amazon.com and Amazon UK). Note for these, you get a random one in each box. This is a pretty solid toy, but I felt it was expensive for what it was and not being able to choose the colour. On the other hand, the toy stands up firmly, which is good for a cake topper. It might also be just the look you’re after. Unicorns could obviously be swapped out for other toys, to match the interests of the person receiving the cake. The main thing is to use plastic toys without any hair strands or the like, so the toy doesn’t leave bits in the cake, and the cake can be washed off the toy. Image Caption: A close view of the unicorn on the cake. They’re a plastic model with a white coat, golden horn and hooves, and rainbow mane and tail. They have a horseshoe of rainbow gems on their back end. They have a front hoof raised as though about to walk. There’s glitter on the hooves, mane and tail. Another possible use for these recipes is pride events and the like. There are a number of cakes with striped rainbow layers, which look a lot like pride flags. The piñata cake looks like a gender reveal cake with rainbow sweets, so could work for an adult having a non-binary gender reveal party. Some recipes are more challenging than others. This means I wouldn’t advise anyone inexperienced to pick recipes to try at random. Start with easier ones like the fudge, and move on to the bigger projects later. Most recipes do use colourings, so it could be an issue if colouring is a problem. But some are coloured with fruit, such as the jellies, and natural colourings could be used for other recipes (these are usually paler, but would still be colourful). It would also be possible to do recipes without the rainbow part. I thought this was a strong book that did what it set out to do. It’s whimsical and makes it clear how to handle layering all the colours. There’s a good balance between basic recipes and advice on how to make things look decorative. The rainbow fudge was particularly popular with the family, and I’m sure I’ll be asked to make it again. 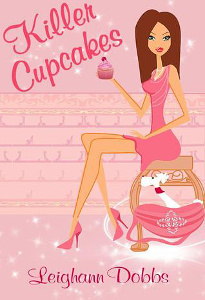 This is a book about decorating cupcakes. The designs tend towards the whimsical, with cute critters, cakes that look like other food, and similar things. I can’t fault the layout of the book, as it’s very clear. There are decent photographs of each design and templates for shaped parts where needed. The opening explains basics like how to ice in different ways and how to turn a food bag into an icing bag. However, the proof in the pudding (or cake) is trying the instructions, which is what I’ll focus on in the rest of the review. My first attempt was the design called “Rabbit Holes”. These are the back ends of rabbits, placed among other cupcakes that look like grass. I tweaked the design a little, as it used crunched up chocolate biscuits for the bunny fur. One of the family doesn’t like chocolate biscuits and I don’t eat crunchy textures. So I swapped that out for white chocolate curls, and made white/pink Easter bunnies instead. An issue that came up in the preparations is this is an American book and I live in the UK. The feet of the rabbits were circus peanuts, which is something I’ve never seen here. I used fondant icing and shaped my own bunny feet as an alternative. Corn syrup, used to stick the bobbles on the bunny tail, is also not a UK product, but that’s quite often available in the import section of supermarkets. I did use corn syrup, but would have got the same result with a little basic icing (icing sugar and water). This would also avoid buying an item when such a small amount was needed. Overall, this is a very forgiving design. The sprinkles to make the rabbit fur hide any mess in the icing below. The iced grass cakes can be messy without it looking bad, as grass doesn’t have to follow any set pattern. I found the instructions clear, and it wasn’t difficult to modify as needed. 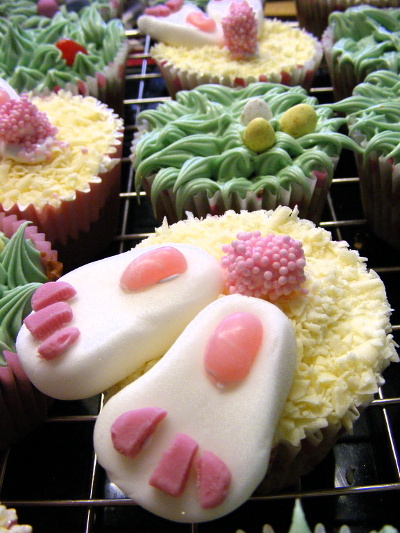 Image Caption: Rabbit and grass cupcakes. The rabbit cakes are the back end of a bunny, with white chocolate curls as fur. A bobble tail (coated in pink nonpareils) is in the centre of the bunny cakes, with two back feet made of white fondant icing and pink chocolate details sticking over the edge of each cake. Around them are grass cupcakes, with piped green buttercream, and jelly beans and chocolate eggs on the grass. I also tried the “Pumpkin Patch” design. The base cupcakes baked flat (more on that later), so mounding the icing as described was a challenge. I wasn’t happy with the result. My usual cupcake recipe would likely rise better, making the mounding process easier, and meaning it wouldn’t require too much icing to achieve. Another problem with the pumpkins was the writing icing I used didn’t really match the orange of the chocolate curls I used to coat the pumpkins. This was a supply issue rather than being anyone’s fault, but not being able to get the right colours matters a lot more with this design. There isn’t as much room to use different colours or tweak the design. All that said, the family thought they were good, so it wasn’t a complete disaster. But designs like the rabbit holes are much more forgiving when it comes to having to use alternate items. 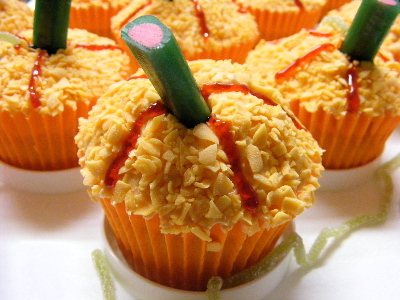 Image Caption: Pumpkin cupcakes. Orange cupcake cases contain mounded cakes covered in orange chocolate curls. Darker orange icing marks out the segments of the pumpkin. A piece of green liquorice with a pink centre is on top as a stalk. I’d say the ease of the designs is going to depend on how easy it is to get the items used. Americans will find it a lot easier to follow the instructions. Even there, the claim that anyone can make these is an exaggeration, as it does take a bit of skill to get a cake looking reasonable. I also think some of the designs would be daunting to a beginner, as they used so many different items. Some of these could be simplified down and still look and taste fine. Though this is mainly a decorating book, there are a few cupcake recipes. I’d note my standard recipe for cupcakes is to use equal amounts of self-raising flour, sugar and butter, with an egg or two. The recipes in this book were somewhat different. Partly due to cultural differences, as self-raising flour isn’t a thing everywhere, so it uses plain flour with raising agents added. However, some of the differences didn’t make very good cakes, in my opinion. Vanilla cupcakes are a staple in my family, as they are one of the few that everyone likes. The recipe here uses butter and vegetable oil. The latter turned out to be an issue. It made the cake mix very runny, which was harder to handle. The cakes baked very flat, which wasn’t good for the pumpkin cakes, and meant they weren’t as fluffy. Also, the oil leached into standard paper cases, which didn’t look very good. They need thicker cases or foiled cases to work. There can be a bit of this with any cupcake baking, but it was much more pronounced using vegetable oil. I sort of tried the lemon poppy-seed cupcakes, but I altered the recipe before using it. This is because the only lemon included is a bit of grated peel. This recipe is something I’d expect at fancy restaurants, where stuff only tastes of a hint of whatever it is, because bland is fashionable. With my whole working class upbringing thing, I like my lemon cake to actually taste of lemons, so I swapped the cream cheese for lemon curd. I didn’t feel inspired to try the other cupcake recipes. I did try the almost-homemade vanilla buttercream, but it’s a little strange that it uses marshmallow fluff. Buttercream is very simple to make from scratch. This takes that and makes it more complicated. Which is a comment I’d have with a number of the recipes. It was interesting to try the variations, but they aren’t what I’d give a beginner, and I didn’t notice any improvement in taste or texture for the extra hassle. When it comes to cake decorating, there’s a lot to like in this book. There are many cute designs, which can act as inspiration even if they’re not directly followed. It explains basics like how to ice things, and I particularly liked the tip of using food bags as an icing bag. I do think there’s a bit of a mismatch in places between the intended beginner audience and the complexity of the projects. Also, the recipes are something I’d skip. Lexy’s ex-boyfriend is killed with poisoned cupcakes from her bakery. With the bakery closed for testing by the police, she sets off to investigate. 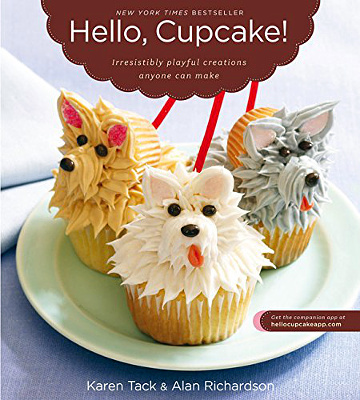 The book also includes recipes for cupcake tops and frosting. On the positives, I liked that Lexy is mainly surrounded by women. Her best friend is also a woman and she gets help from a group of elderly women. That does tend to be a strength of cozies, but it’s not something to take for granted. There wasn’t a love triangle (it’s obvious who the love interest is and that they’ll end up together), which is a good thing for me as I find love triangles endlessly angsty. On the negatives, the mystery was barely there. The character motivations were stretching it even for a cozy (like the police took all the ingredients from the bakery to test, rather than samples, which makes no sense even with handwaving police procedure). There isn’t really anything new here in terms of the plot, characters and setting. I also dislike books where the main character can eat anything and not put on weight, and it’s portrayed as a wonderful thing. I tend to lose weight quickly and put it on slowly. It’s not wonderful. It means sugar crashes where I stop functioning if I forget a meal. It means even mild sickness can mean dropping underweight. This isn’t a trope I can find fun. Overall, the writing flows well enough and it succeeds at its aim – it’s a light-hearted book that can be read quickly, without a whole lot of attention required. I wouldn’t recommend it if you’re looking for a strong mystery, but for a bit of light romance and mystery (plus recipes), it might fit the bill. 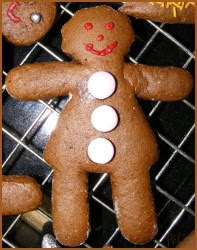 I planned to bake some gingerbread men this year, as my gift to the family. 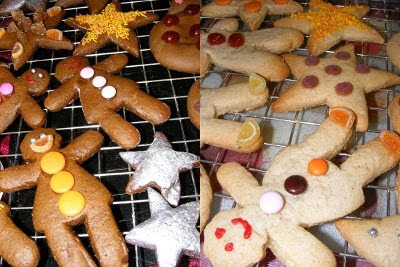 The only thing in the way was I couldn’t find a gingerbread recipe that fitted what I wanted – a version that was very strong, for the person who likes ginger sprinkled on their ginger; and a version with no ginger, for the ginger hater. So I made the recipes up. As these recipes are mine, all mine, and not copyrighted to anyone but me, I’m posting them for the world (and if you thought I was joking in the blog tagline about random tangents, now you know it’s for real… though this is the first time I’ve posted a recipe). It’s a pretty standard gingerbread recipe, apart from the seasoning. But still, I can feel a certain amount of yayfulness for making it up and it working. (In the end, I preferred the vanillabread men to the strong gingerbread men, but the family were split on which they preferred, so I take that as success). Makes about 12-15 biscuits, depending on the size/shape of your cutters. Don’t forget to buy some stuff to decorate them afterwards. 2. Sift the dry ingredients together (flour, bicarb, salt and dry seasoning). 4. Cover and put in the fridge for an hour. 5. Once cool, the dough should be reasonably firm. If not, add a little more flour. 6. Roll out to about half a cm (1/4 inch) thick and cut out shapes. Make sure to dust the surface and the rolling pin with flour, or it’ll stick. 7. Place men on a tray – either lightly greased or covered in non-stick baking paper (I used paper, as one sheet will last for all the batches and it’s easier to remove the cooked biscuits). Cook for 10 minutes in a preheated oven at 180 C / Gas mark 4. 8. Place on a wire tray to cool. 9. Decorate when cool with whatever you want. I used icing, sweets, crystallised ginger and edible silver spray. TASTE TIP: Strong gingerbread tastes slightly bitter, and isn’t like the stuff in the shops. It can be a bit surprising if you’re not used to it. If you want a less extreme basic gingerbread, swap the treacle out for some sort of light syrup/honey, and cut down the ground ginger to one teaspoon. You can also swap the dark brown sugar for light brown sugar or white. ZOMBIE TIP: It comes out of the oven soft, but hardens as it cools. Don’t cook for longer than 10 mins as it’ll cool so hard you can use it as ammunition in the event of a zombie apocalypse.